Invisalign® Katy: Learn All About The Benefits of Invisalign! Having straight and beautiful teeth is something people dream about. A smile is so important because it displays your happiness and joy. Having a great smile is one way to feel confident, and good about yourself. A way we achieve this is Ultra White Dental in Katy is Invisalign® . 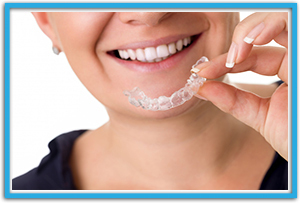 Invisalign is a tool, similar to braces, that shifts the teeth slightly to perfect your smile. This is done with trays that mimic retainers that you wear every day. These trays are preferred because they are clear and you won’t have a mouth full of metal! Ultra White Dental wants to let you know some other great aspects of Invisalign! Traditional braces inhibit you to consume a lot of your favorite foods like corn on the cob, pizza, apples, and other delicious treats. However, with Invisalign, you can eat whatever you want because the trays are removable! This means if you want some sticky taffy you can have some. This makes Invisalign a great alternative because you don’t need to alter your eating habits completely. Remove your trays whenever you want! Going back to the eating aspect, whenever you want to remove your trays, you can! So, if you have an important work presentation, a date, or a special outing with your family, you don’t need to have the trays present. We at Ultra White Dental do advise you to wear your Invisalign as much as possible, but we also understand it is important to have it out on occasion. Easy to keep up with your oral health! Braces make it hard to brush and floss your teeth because the brackets are in the way. You have to acquire special tools and tricks to really get your teeth clean. With Invisalign, your oral habits don’t have to change! You can brush your teeth with ease, still use the mouthwash you love, and flossing will be a breeze. You won’t need to feel self-conscious! Especially when you are an adult, dealing with oral health can be a little daunting. We want you to feel confident as you are achieving your dream smile. Sometimes, people with braces feel juvenile, because braces were intended for kids still in grade school. Invisalign is discreet, so most people won’t know you are even fixing your teeth as you speak to them! This is a huge perk to using Invisalign, and for you as well. Don’t feel the discomfort of braces! Many people who have had braces in the past said they are very uncomfortable and quite painful. When you have braces you frequently have to go to the orthodontist to get them tightened. This is an unpleasant process and happens more often than not. With Invisalign, this is a step you can skip. You have different trays for different stages, and even though your teeth are shifting, it will be far less painful than the tightening of braces. Plus, you won’t have to face wires poking and prodding you in the cheek and gums either, ouch. You don’t need Invisalign nearly as long! With braces, someone may have to endure these metal devices for almost five years, depending on the severity of the teeth adjustment. With Invisalign, the process is usually much faster, at a year and a half. The process is faster because of the alternating and changing of the trays. They will be shifting your teeth and you will hardly notice, until one day you look in the mirror and your smile will say it all. At Ultra White Dental, in Katy, we want to give you the best oral care, and the most beautiful smile. Call us today and set up your Invisalign appointment. We will always give you a comprehensive exam and figure out what dental treatment serves you best.